Platt Park Homes for Sale 1573 S Lincoln listed at $490,000.00. Rare Tudor-style home in Platt Park. 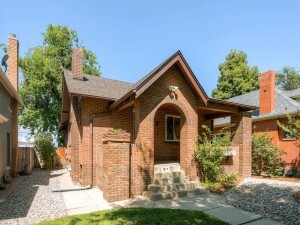 This charming home has been wonderfully maintained and upgraded through the years. Remodeled kitchen featuring granite countertops and stainless appliances opens to the dining room and living room–perfect for entertaining. The living room has as its centerpiece a cozy fireplace. All the main level has newly refinished hardwood floors. Two bedrooms and full bath on the main level. Downstairs is a large family room with wet-bar. A third bedroom with french doors would also serve well as an office. Laundry room and three-quarter bath to round out the basement. Entertain in the spacious backyard or spend a quiet evening on the covered front porch chatting with the neighbors. Situated on a wonderful quiet block just a short stroll to all the shops and restaurants of Old South Pearl and Broadway. New roof, updated plumbing, electrical, sewer, furnace…little to do but make this delightful home your own. The main floor has 917 square feet with two bedrooms and a full bath. The kitchen has been updated and opened to the dining and living room creating a great-room feel. The basement has 917 square feet most all of which has been finished. The 1500 block of Lincoln is a great block in Platt Park, it is quite and a straight shot over to the heart of Old South Pearl and around the corner from some of the best restaurants, shops and hangouts on the revitalized Broadway corridor. Give me a call at 303-877-3097 to arrange a private showing.